Caviar and Champagne have never married as well as they do at this Midtown caviar lounge. : Even the most novice caviar eater may have heard of Calvisius. That’s because the caviar is often served at topnotch restaurants around the world and sometimes makes an appearance in first-class airline cabins. But those hungry for the prized fish eggs can now go right to the source. Well, at least right to the caviar producer’s own lounge. Located in the Four Seasons Hotel New York, this diminutive lounge (and shop) serves up several varieties of caviar, as well as the beverages that pair so nicely with this delicacy: vodka drinks and Champagne. Options include caviar “Solamente,” meaning just caviar, but it’s best when paired with something. The “Italian Way” means it comes atop a soft potato purée. We also recommend pairing it with a quail egg. 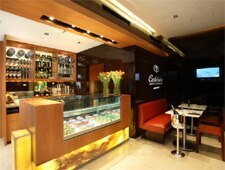 Patrons choose from three different kinds of caviar and then sip Champagne all the way to a caviar-induced euphoria.